Keep in mind that the internet is overflowing with information, including pictures of almost everything that we grow. Also, we have two sections on our website to help you identify unfamiliar produce with color images including descriptions of appearance, taste, nutrition, uses, storage, and seasonal information. You can find this under “CSA Info” on the “Veggie ID” page and also under “Recipes”, the section is called “Produce Information Organized by Plant Part”. We already have some ideas on how to make it easier for you to use (especially an alphabetical tag list of produce), but it’s as good as it gets for this season. Please feel free to pass along any ideas you may have to make it more user friendly. BEETS: You will receive Golden Beets (orange skin with rich gold interior; mild, sweet flavor when cooked). See Week 1 newsletter for storage and usage information. How to use: use raw, steamed, sautéed, stir-fried, in casseroles, soups, pizzas, etc. CARROTS (Nelson): a sweet, blunt root with smooth, crisp texture and deep orange color. See Week 2 newsletter for storage and usage information. GARLIC: a bulb of several papery white cloves. See Week 1 newsletter for storage and usage information. KALE (Green Curly): well ruffled green leaves with strong, cabbage flavor. **Excellent kale chip recipe on website! See Week 1 newsletter for storage and usage information. ONIONS: You will receive yellow (Prince) or red (Mars) onions. See Week 1 newsletter for storage and usage information. GREEN BELL PEPPERS: green blocky cells with fruity, sweet flavor; excellent source of vitamin C, fair amount of vitamin A. See Week 1 newsletter for storage and usage information. POBLANO PEPPERS (black-green heart-shaped fruit, which is mildly pungent with a lightly sweet, medium-hot flavor). POTATOES (Butte): russet baker that is highest in vitamin C and protein; great baked, mashed or fried. See Week 1 newsletter for storage information. POTATOES, FINGERLING: a small, stubby, finger-shaped type of potato, which is usually a heritage variety; excellent roasted or boiled. See Week 2 newsletter for usage and storage information. RADISHES (Amethyst): bright purple skin and crisp, mild white flesh. See Week 1 newsletter for storage and usage information. DAIKON RADISH: looks like an overgrown white carrot, but with a slightly mild radish taste. Lots of recipes on the internet. See Week 2 newsletter for storage and usage information. RUTABAGA purplish skin with yellow flesh; thought to be a cross between a cabbage and a turnip and resembles a large turnip (3 to 5 inches in diameter). How to use: Bake, steam, or boil so it cooks up to a creamy texture as nice addition to mashed potatoes, can be substituted or added to pumpkin or squash pies, or baked in a root bake, and often a key ingredient in making pasties. SALAD MIX: You will receive a bag of mixed salad greens—arugula, tatsoi, and baby green and red leaf lettuces. a custom mix of red and green lettuces such as Rouge D’Hiver, Parris Island, Royal Oak, and Saladbowl. See Week 1 newsletter for storage and usage information. SCARLET QUEEN TURNIPS: large, flat-round, sweet, crisp, white flesh with spicy, red skin. SWEET POTATOES (Beauregard): large, edible root related to the morning-glory family that has dark red-orange skin with a vivid orange, moist, sweet flesh; high in vitamins A & C.
WINTER SQUASH: You will choose from 3 items: Acorn (small, green ribbed squash with pale yellow flesh; great stuffed with rice, breading, or soups), Butternut (light, tan-colored skin; small seed cavities with thick, cylindrical necks; bright orange, moist, sweet flesh), or Delicata (small, oblong, creamy colored with long green stripes, only slightly ribbed; pale yellow, sweet flesh; edible skin; best eaten within 4 months of harvest). See Week 1 newsletter for storage information. 2. HARVEST AT THE FARM: Please call ahead if you plan to u-pick or pick up on other days besides Farm Distribution Days (Wed. and Fri.), so we can make sure someone is around. U-pick Kale and Collards–$1/lb. Good time for freezing. 3. THANKSGIVING SHARE AVAILABLE! 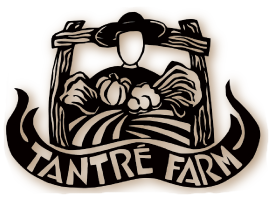 We still have room for more members to pick up a share on Nov. 17, the Saturday before Thanksgiving, at the Ann Arbor Farmers’ Market from 7 A.M. until noon or at Tantré Farm from 2-5 P.M. It will be $108 this year. Please request a form at Distribution Sites or call or e-mail us. Full payment needed by Nov. 10 for you to be registered. Non-CSA members are welcome to register. 4. INTERESTED IN JOINING OUR CSA IN 2013? Shares for current members and non members will be available for $600 (Farm) and $625 (Ann Arbor or Chelsea) from June through the middle of October. We will be accepting $100 deposits ($25 of that deposit is nonrefundable if you choose to cancel your share) to reserve your share for 2013 starting now. Please ask for a registration form at the distribution sites if needed, or it can be sent online and through the mail. Washtenaw Food Hub (Sat.) — 8 A.M. to 12 P.M. The round and golden moon floats on the horizon just above the silvery cushion of clouds. The north wind blows through the leafless tree branches day and night swirling the fallen brown leaves. Evergreen boughs bend, bob, and bow. The weather is imposing and blowing cold. Where are the birds, butterflies, and bugs when the wind blows so hard? Perhaps protected in a bark crevice or a seam of barn siding standing or sitting still and trying to stay warm and hang on. The season is changing. We are pulling out beets, carrots, potatoes, rutabaga from the cold soil and plugging in garlic cloves to grow all winter in the frosty cold, waiting for a distant spring, a sprouting surprise. Greens and carrots have the sweet kiss of frost and will continue to sweeten as the frosts continue the nightly sparklings. The root cellar is full of potatoes. The big red barn is nearly full of squash, onions, garlic and sweet potatoes. The end of the season is near, and even winter seems to be nipping at our heels. As the weather brings a dramatic wind and cold storm, we can take refuge in the hearty hard work of harvest, and plant some hopeful garlic for next year’s summer. Coming inside to truly enjoy the glowing of the woodstove, a dinner table loaded with the abundance of the autumn, and the love of many happy harvest hands, we feel appreciative and satisfied. Please feel free to contact us throughout the rest of fall and winter for more of these storage crops or come visit us at the Ann Arbor Farmers Market or Lunasa Market. Thanks for joining us for this “changing of the seasons” journey. CAULIFLOWER CHEESE CHOWDER (from Rolling Prairie Cookbook by Nancy O’Connor) Serves 4. Heat oil in soup pot over medium heat. Add onion and garlic and sauté until tender, approximately 10 minutes. Stir often to avoid scorching. Add flour, stirring constantly for 1 minute. Slowly add stock or water, using a whisk if necessary to avoid lumps. Add cauliflower, potatoes, and salt. Bring just to a boil; reduce heat, cover, and simmer until vegetables are tender, approximately 20 minutes. Remove about half of the cauliflower and potatoes from the pot using a slotted spoon. Set aside. Let the remaining soup cool a bit and then puree the soup in a food processor, blender, or with a hand-held blender right in the pot. Return soup to pot, and add reserved cauliflower and potatoes. Heat to a simmer. Slowly whisk in milk, then grated cheese. Heat over low heat until cheese is melted. Season with black pepper and a small amount of nutmeg. Serve with snipped chives or parsley. MASHED RUTABAGA AND POTATOES (from www.southernfood.about.com) Serves 6 to 8. Cook rutabaga and potatoes in salted water in separate saucepans. When both are tender, remove from heat. Rutabaga will take about 30 minutes, and potatoes will take about 20 to 25 minutes. Drain; puree or mash rutabaga well, then mash the potatoes. Combine mashed rutabaga and potatoes; add butter, milk, pepper, and nutmeg. Beat well. Taste and add more salt if necessary. Garnish with chopped parsley, if desired. In large bowl toss potatoes with oil and seasonings. Spread in a single layer in a baking pan. Bake for 30-40 minutes (until tender and golden) in a 425 degree oven. YUM! YUM!